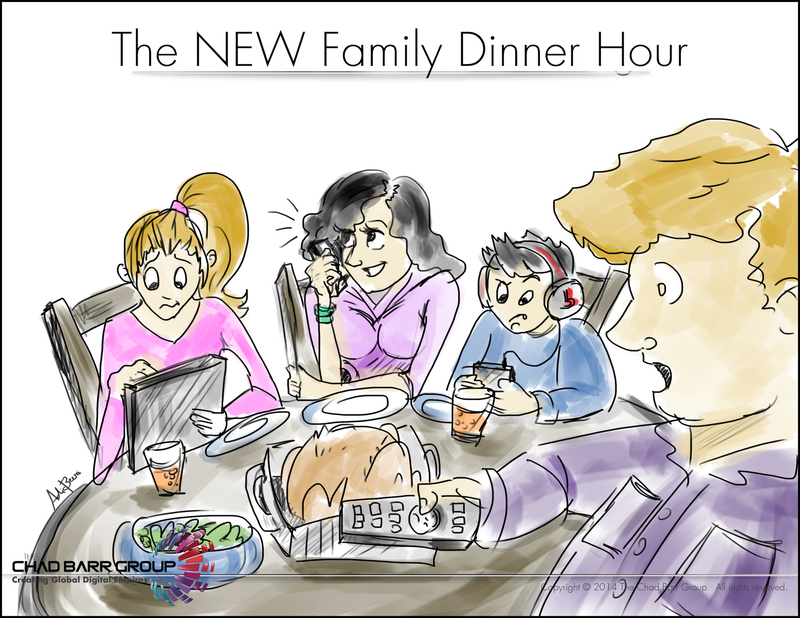 This week’s reflection point: Has technology taken over your family dinner hour? Many decades ago when frozen TV dinners were the newest craze, we began losing precious family time staring at the TV while we ate. The family dinner time to talk about business, schoolwork or highlights of our day stared slipping away. Today, we are incessantly checking for emails, messages, Instagram or Facebook posts all throughout the day. Go to any restaurant and you will find folks on their iPads and cell phones as soon as they are seated, even before the menus are handed to them or napkins unfolded. No conversation happening here. Some people have made a game out of it; all cell phones are placed down on the table and the first one to pick his up and look has to pick up the check for the whole table! While staying connected with clients, family and friends is important, we need to keep a time carved out of the schedule for old-fashioned communication where we actually speak to one another, look into their eyes, and have a real conversation. The news, gossip, and instant messaging can all wait a few minutes longer. Our fast changing technology is wonderful and we couldn’t live without it. But hey, let’s have our soup while it’s still hot, our meal before it’s turned cold, and enjoy one another’s company and chatter. The messages will be waiting for you after dessert. I promise. This week’s tip: Technology keeps us instantly connected to our clients and customers. Let’s unplug for a few minutes a day to get “reconnected” to our families and enjoy the company without distraction.